Upcoming Meetings - Beaudesert Districts Orchid And Foliage Society Inc. Meetings are held on the third Wednesday of the month. 7.30 PM at the Canungra School of Arts Hall, 3-7 Pine Street. Members and visitors travel from as far afield as the Gold Coast, Beaudesert, Jimboomba, Tamborine, Tamborine Mountain, Springbrook, Rathdowney and Running Creek, meeting monthly in a friendly and supportive environment to further the aims and objectives of the society.We invite members to bring along their orchids and foliage to table for judging at our monthly meetings. The business of the meeting commences at 7:30 pm with the formal aspects of the meeting. This is normally followed by a guest speaker on subjects aligned with the cultivation and showing of orchid and foliage plants. There may also be special nights where the guest speaker is invited to present on other subjects thought to be of interest to the membership. The meeting breaks for Supper, supplied by the members. Following a supper break, the judging results on the orchids and foliage tabled for judging on the night is presented by one of the judges or experienced club grower. 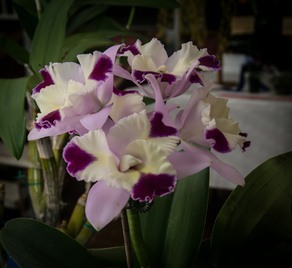 Awards are given to the Member’s Choice in both the orchid and foliage sections. This is followed by the presentation to the winners of the lucky door prize, an exhibitor’s prize and the raffle prizes. Meeting normally concludes between 9:30 and 10:00 pm. We also have bark, pots, tags and other accessories for sale on our meeting nights. If you would like to become a member of the Beaudesert Districts Orchid and Foliage Society, please download a membership form here.